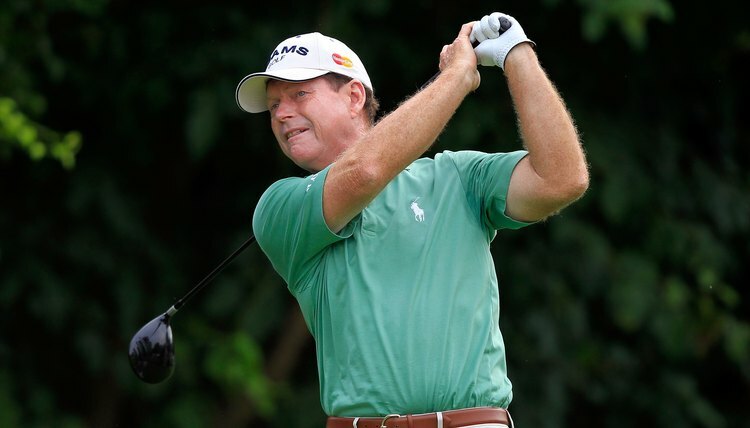 Tom Watson is recognized as having a smooth, rhythmic swing. Many golfers become so mechanically minded that they don't swing the club – rather, they just move it from one position to another. When your movements are stiff and calculated, you eliminate any possibility of developing the feel necessary to play good golf. Your swing should be a graceful, flowing movement. Learning to "let it go" while retaining control of your swing isn't hard to do as long as you keep a few simple things in mind. Relax. Feel begins before you ever grip the club. Get rid of the tension in your arms and legs. Some people like to gently shake their limbs to eliminate tension, while others find that tensing their body for a few seconds allows them to relax better. Taking several deep breaths is helpful. And don't forget to relax your jaw; many players unconsciously clench their teeth as they prepare to hit the ball. Coil and uncoil your body a few times. Some players prefer to hold a club and swing it like a baseball bat or a tennis racket at waist height. Holding your arms at shoulder height and turning as far as you can, back and forth from left to right, can help relax your hips and lower back. Allow your heels to come off the ground as you do; this will allow your knees and legs to relax as well. A good drill without a club involves crossing your arms on your chest and mimicking your golf swing. Let your hands and arms control the swing. One of legendary teacher Bob Toski's favorite drills is to take a club in each hand and swing them back and forth in unison. By trying to keep your arms relaxed and both clubs in sync as you make your golf swing, you'll develop a better swing rhythm that will make your swing feel more natural. As Toski says, "Suddenly, 'shifting your weight' and 'pivoting' aren't such a chore – you've let your hands and arms lead." Grip the club and take practice swings. With your body relaxed and a good feel for the rhythm of your swing, you're ready to start thinking about your stroke. Before hitting any balls, try to duplicate the feelings of the other drills with your practice swing. Concentrate on the flow you've already developed. Hit some balls with your practice swing. Bobby Jones once told about his father's frustration during a round of bad ball striking. Angrily he made a perfect practice swing and asked Jones, "Now what's the matter with that swing?" To which Jones replied, "Nothing. Why don't you use it sometime?" Most of us make wonderful practice swings with great feel, only to tense up once we get over the ball. Learn to use the rhythmic swing you've developed both during practice swings and actual play. Then you'll have a swing that you can really feel.